he nonprofit Bernell Grier leads has fought to protect low- and moderate-income residents from being driven out of gentrifying Brooklyn neighborhoods for longer than many of our readers have been alive. Members of Pratt Area Community Council launched Displacement Watch to keep tabs on this looming threat — a half-century ago. Today IMPACCT Brooklyn, as it’s now called, continues that work in several ways. One is through participation in Stabilizing NYC, a citywide coalition funded by the City Council to teach tenants how to organize and fight landlords who use “unsavory” tactics to push people out of their homes, said Grier, who is the executive director at IMPACCT Brooklyn. 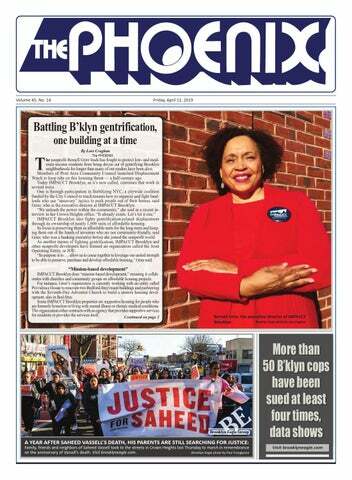 “We unleash the power within the community,” she said in a recent interview in her Crown Heights office. “It already exists. Let’s let it rise.” IMPACCT Brooklyn also fights gentrification-related displacement through its ownership of nearly 1,000 units of affordable housing. Its focus is preserving them as affordable units for the long-term and keeping them out of the hands of investors who are not community-friendly, said Grier, who was a banking executive before she joined the nonprofit world. As another means of fighting gentrification, IMPACCT Brooklyn and other nonprofit developers have formed an organization called the Joint Operating Entity, or JOE. “Its purpose is to … allow us to come together to leverage our united strength to be able to preserve, purchase and develop affordable housing,” Grier said. Bernell Grier, the executive director of IMPACCT Brooklyn Eagle photo by Lore Croghan Brooklyn. Family, friends and neighbors of Saheed Vassell took to the streets in Crown Heights last Thursday to march in remembrance Brooklyn Eagle photo by Paul Frangipane on the anniversary of Vassell's death. Visit brooklyneagle.com. IMPACCT Brooklyn is looking to expand its work as a services provider through new supportive housing it builds. The group also fights the displacement of low- and moderate-income Brooklynites from their neighborhoods by helping those threatened with eviction and teaching tenants how to navigate affordable-housing lotteries and become financially fit first-time homeowners. It also provides legal and financial services to small business owners. ized the bank’s operations — and got a “yes.” “My parents always taught me the worst thing that anyone can ever say to you is no, so why not ask?” she recalled.